Following the success of the calendars, the next step of the Giles Smith Photography (GSP) project was for Giles to raise enough money to purchase a new and better camera, plus any other kit he may need to go with it. 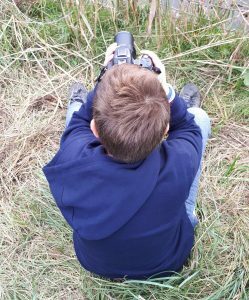 His Charcot Marie Tooth Disease means that his hands are wobbly so we were looking for a camera with amazing image stabilisation that is light enough for him to manage for a full day out and has the zoom that he loves for his nature shots. Following sales of the framed prints, some serious saving and some paid photography work, we visited Jessops in St Albans in May. We were looked after brilliantly and came away with a new Olympus mirrorless camera which is perfect. He now has the mirrorless camera and three lenses, a monopod and a camera bag that he can manage himself. The next thing he’s saving for is a teleconverter to increase the amount of zoom he has and he also wants to start saving so he can buy himself a treat every now and again. In terms of his autism, Giles is much happier, calmer and able to cope with the world around him when he’s out with his camera. His knowledge of the natural world impresses most of the RSPB volunteers we meet, all of whom are more than happy to help him spot birds, share their telescopes and help him out with any queries. This project is more than just about the photography though. The calendar project was a massive confidence boost to Giles – to the extent that he became much happier going into school because he had a real sense of purpose in what he was doing. He initially thought he might sell 4 wall calendars and 2 desk ones – in the end it was 154 calendars in total! He is actively involved in his website design, chosing which images he shares (and any editing work that needs doing) and in the finances of running this mini business/fundraising enterprise. With pre-orders for the 2019 calendar, requests for greetings cards, downloads and other photography requests, we’re hoping to continue building on the skills and positivity this project brings.